A sad day. Rusty deteriorated during the course of the morning. She just lay still with her eyes open looking very weary. We took her to the vet after lunch . They examined her again and showed me her gums and tongue which had turned white meaning she was very anaemic. Rosemary felt her tummy again and said there was a hard mass and also smaller lumps and she thought it was most probably her liver with a tumor. She said that really there was no point in doing anything and that it was time to call it a day. Rusty was just limp like rag doll on the examination table – it was horrid. I signed the consent form and walked out with an empty basket. So now I have to come to terms with it. We are going to burn her bed and I shall give all her food to an animal shelter that collects dog and cat food at our local supermarket. If I get a new kitten I can start again with new bedding. Sorry, but I don’t feel like writing about yarn right now – I will OK tomorrow. 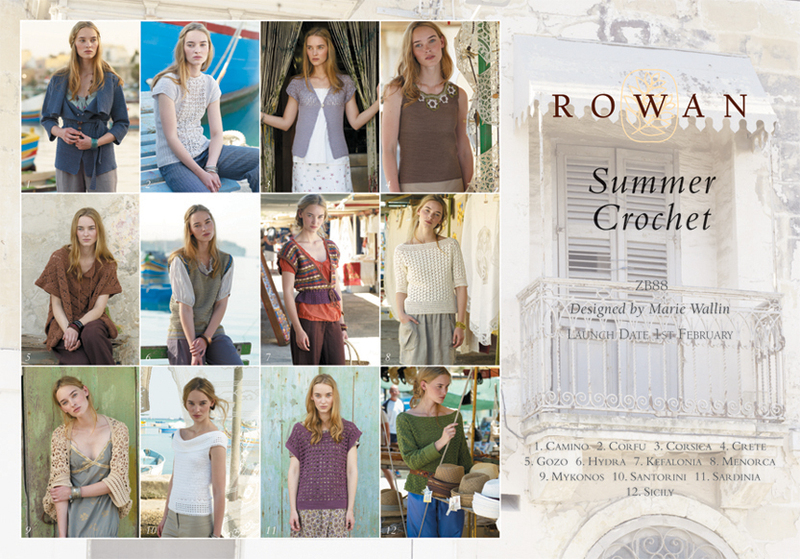 Today’s pic is Rowan Summer Crochet – their first book devoted entirely to crochet patterns. There are 12 designs that use either Rowan Cotton Glace or Rowan Classic Siena. I have bad news about Rusty. The vet telephoned yesterday and she has cancer and there is nothing they can do. So now I have to make the decision – do I watch her waste away or have her put to sleep? She is so thin – I can feel every bone in her body. She is eating a little but not with much enthusiasm. I think we will take her to the vet tomorrow – I don’t think she is in pain but it is no life for her. I did groom her today but I am afraid of hurting her with the comb – I could feel every bump in her spine. All her long fur has gone – she looks like a short-haired cat. But she still has her splendid whiskers. I just wish she would go to sleep and not wake up. Sorry for being depressive – I will feel better once it is over. Back tomorrow. 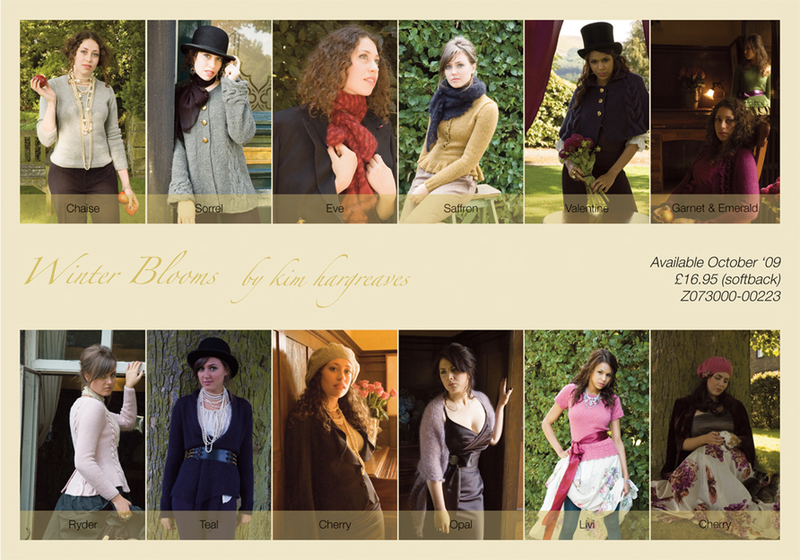 Today’s pic is of designs from Kim Hargeaves Winter Blooms which is going to be available any day now. It was promised for mid October but was delayed. Now for some more discontinueds: Lenpur Linen : Sol. 2 new shades in this range Pima Cotton : Discontinued: Citronella,Tango, Icing and Blue Wash. No new shades.Pure Silk DK : Discontinueds : Pumice, Lichen, Patience, Bliss and Raven. No new shades. As you can see, Rowan have slimmed down some of the ranges which is a good idea – it is impossible to stock all the shades when there are over 20 in some yarns. The new pattern books concentrate on existing yarns – I will tell you more about them tomorrow. My chilblains are driving me mad – my fingers have gone from being sausage size to sausage dog size!! They are either aching because they are cold or itching when they are hot. I have discovered that a starched net curtain is very good for scratching!! We are going out for a drink now – only one or maybe two! Back tomorrow. 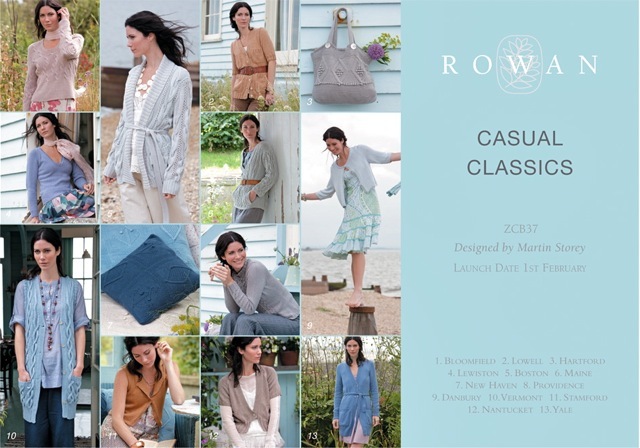 Today’s pic is of the new Rowan Classic Casuals book which contains 12 deigns by Martin Storey, Yarns used are Milk Cotton DK, Organic DK, Pure Silk DK and Lenpur Lnen. Fine Milk Cotton : Sherbert, Barley Sugar, Dip Dab, Bonfire Toffee, Tutti Frutti and Bon Bon. 6 new shades in their place. 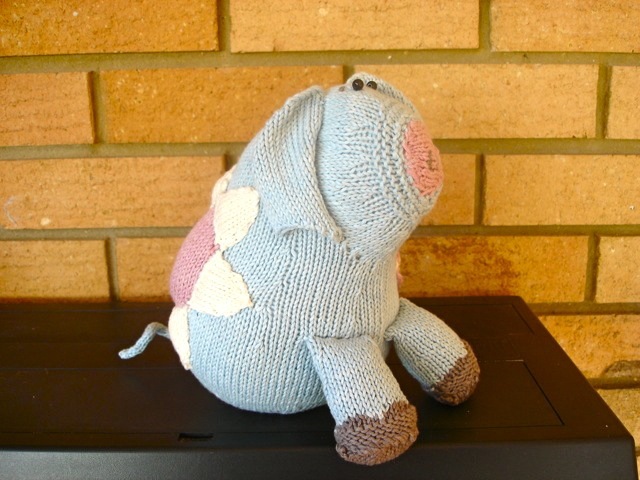 The Rowan rep brought me a gift – she knew how much I like Rosie the pig in the Organic Kid’s Collection and so she knitted one for me! One more piece of news! Rowan Studio 18 is devoted to the Felted Tweed family. Now I was going to tell you about Mrs Jones and the Persian carpet. For those of you who don’t know about Mrs Jones, she was an elderly lady who lived in the farm that is opposite my house on the other side of the valley. She was a widow and did not live in the farmhouse but had converted ( after a fashion!) the cow sheds and lived in them. She kept cows, sheep and Peacocks and had a very large Great Dane dog called Jason. She was in her late seventies when we got to know her. Her sitting room was very untidy – dog food, peacock food and sometimes even a peacock perched on a chair! She had beautiful antique furniture and glasses but they had all gone to ruin through neglect. One evening as we were having a gin and tonic she said that Wilfred, an old friend, was moving back to England from India and she would have to try and clean the Persian carpet in case he wanted it back. Apparently, the filthy carpet under our feet was, in fact, a valuable Persian carpet that she had been looking after for Wilfred! It was really dirty – muddy footprints, feathers and lots of other unmentionable things courtesy of Jason and the peacocks! No way could she get it clean – it would need professional attention. As luck would have it, Wilfred died before he could return and so the carpet stayed in the same state! I will tell you about Mrs Jones tomorrow! 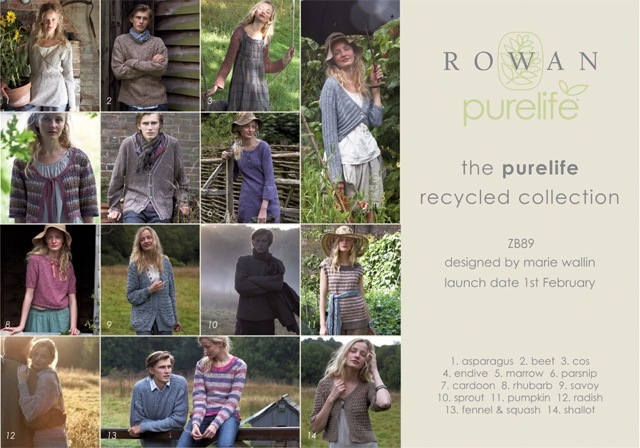 New Rowan Purelife Recycled Revive. Kay, the Rowan rep came this morning and I have seen all! First of all, Cotton Jeans, Bamboo Soft and Natural Silk Aran are totally discontinued. There is one new yarn in their place – Rowan Revive. This is made from recycled silk, recycled cotton and recycled viscose. There are eight shades, all of which are mottled colors. There is a book especially for this yarn – see pic above. Summer Tweed: Discontinued: Hurricane, Cotton Bud, Choc Fudge and Vanity. Two new shades in their place. Handknit Cotton : Discontinued : Primrose, Bermuda. Aqua, Lupin, Seafarer, Rose, Chestnut, Antique. 4 new shades in their place. Kidsilk Haze : Discontinued : Splendour, Putty, Villian, Glacier. No new shades. There are lots more discontinueds and also lots of new books. I will continue tomorrow!! I am a bit behind because of lost time. Back asap! Well, it did not turn out to be the greatest of weekends since I last wrote. We went out on Saturday night for a drink. The pub was heaving – Paul ( the drunken chef) was spit roasting a pig for 200 people – a 21st birthday party. It is a very small old fashioned pub and, because it was pouring with rain, all 200 people came inside rather than be in the garden with the pig. It was manic – nowhere to sit down as the bar stools had been removed to allow more access. I hate standing up drinking – I wouldn’t stand up at home and so certainly do not want to go out and stand up clutching a glass. Paul was swaying about between the bar and the pig – we did not stay long enough to see whether it ever got cooked! When we got home my shoes were wet and I slipped on the kitchen floor and cracked my hip on the corner of the kitchen table. I know what you are thinking but I had only had 2 glasses of wine! Now my hip is very painful – I am aware of anything touching it like my jeans when I bend down. Yesterday it rained all day and was gloomy. Today it has rained again and the river is full to the brim. We shall never get flooded as our house is on the top of a hill. Tomorrow the Rowan rep is coming at 10.00 am and so I will be able to tell you what is coming and what is being discontinued. My guess for discontinuations is Cotton Jeans and possibly Organic Cotton but I could be quite wrong. Time for a bath and my Mojito – Back tomorrow. Accident! I have scalded my left hand. I was pouring some boiling water out of the kettle into a bowl to make some chestnut stuffing for lunch tomorrow and I somehow managed to pout it over my left hand. It did not hurt much at first but it does now!! The Rowan rep telephoned today and she is coming to see me on Tuesday and will show me all the new yarns. She said there is one new yarn and that there are lots of books for existing ones. We are not going out to eat tonight – just for a drink. I am cooking chicken breasts in cheese and bread crumbs with rosemary and garlic roast potatoes and peas followed by millionaires shortbread! Now I must away to the oven – back tomorrow.